Your driveway and patio have end up so damaged that they are getting dangerously slippery? Order the services of Excellent Carpet Cleaning. We are a professional hard floor cleaning and jet washing company delivering first-class cleaning services in Bromley BRat an excellent price. We will gladly provide you with the specialized scrubbing, hard floor cleaning, polishing, anti-slip protection, sealing, tile recoat service you want. Contact 020 3404 0500 or send us an online inquire here for a quick, free and non-binding selling price offer and discount info. Excellent Carpet Cleaning is a top provider of professional hard floor cleaning, scrubbing, polishing, sealing,, tile recoat and anti-slip protection service, tile and grout cleaning, restoration of ceramic and porcelain hard floors, hard floor sanding service, vinyl floor cleaning,, stone and slate floor cleaning, floor sealing and polishing, grout colour sealing and recolouring services in Bromley BR. Our jet washing and hard floor cleaning and polishing services are ideal for all private and business residents of the area. We can clean and rejuvenate all kinds of outdoor and indoor hard floors for you. We use the latest expert cleaning methods, technology and Prochem certified methods which are perfectly risk-free for you, your pets and for the environment. If you would like your hard floor to look as good as new once again, book our qualified hard floor and jet washing service now. All of our experts, pros are qualified and properly equipped to provide you with a reliable and safe hard floor cleaning service. 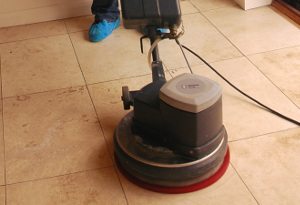 They can easily eliminate scratches, stains and slippage from your personal hard floors. Any dull spots, watermarks and micro scratches will be eliminated, along with the hard floor area soiling. Depending on your hard floor, the service can contain a professional vacuum, the use of cleaning spray, a professional rinse, scrub and dry cleaning process. The cleaners will do a floor polish stripping, cleaning and buffing with the use of high-quality modern technology, emulsification, heat, pressurized cleaning, and effective capture of the waste materials. Once the floor surface has been expertly cleaned ongoing protection is achieved with an impregnator, polish and seal for protection. You indoor or outdoor hard floors will be renewed and covered after we are done. We have set up a client support service to administer and process your bookings within Two hours of your phone call to 020 3404 0500 or your online booking request. You don't need to pay a deposit. The transactions of the set price tag is done after we are done with the cleaning. Our regular customers, those who book early ahead as well as the nearby estate agencies and property owners are given preferential rates. Clients who book a mix of more than one of our services will get big discounts. Book our jet washing and hard floor cleaning service right away and allow us make your hard floor look as good as new yet again!